One man’s backward glance at unexpected lessons, the beauty of relationship, and God’s mysterious guiding hand. Bestselling author and poet Calvin Miller turns his hand to the most moving story of all – his own. 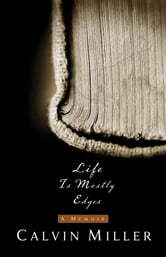 The reader is taken through a myriad of experiences of a young man coming of age in mid-20th century America. Following his life into college, seminary, a small local church and eventually to a new life as an author and professor, the memoir touches on those points that make all of us uniquely human and intensely vulnerable.